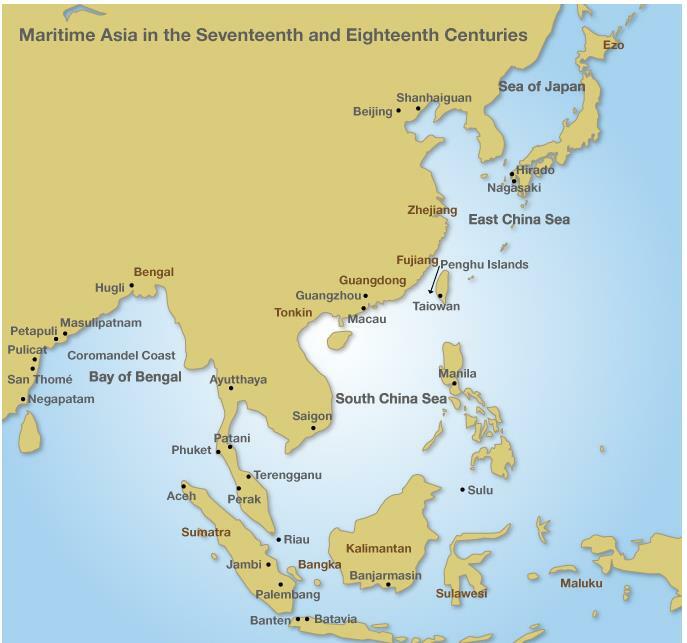 Maritime Asia, as I use the term, encompasses the lands in and around the Japan Sea, the East China Sea, the South China Sea, and the Bay of Bengal, as well as all of Indonesia and the Philippines. The peoples of this densely populated, economically vibrant area, which includes southern coastal China and Japan, have been linked by maritime commerce for centuries, thanks to the seasonal sea breezes caused by temperature differences between the water and surrounding land masses. In the seventeenth and eighteenth centuries, the Dutch East India Company, also known as the VOC (short for Vereenigde Oost-Indische Compagnie, or United East India Company), played a key role in sustaining these links, in the process of building a network that covered almost the entire region. The period of the VOC’s existence (1602–1799) corresponds to the first two centuries of Tokugawa rule in Japan (1603–1867). From the 1630s on, under the shogunate’s strict regulation of foreign commerce (often referred to as “national seclusion”), the VOC was the sole European entity permitted to trade directly with Japan. This, combined with various restrictions and prohibitions on foreign trade imposed by the Chinese authorities during the period, might lead some to suppose that the VOC reaped an easy windfall simply by exercising its privilege within the region’s “tranquil waters.” In fact, the East China Sea was anything but tranquil. A variety of companies, syndicates, and nations vied for control of its trade routes, a rivalry that often played out in violent clashes. These “turbulent waters” set the scene for the VOC’s expansion, as it extended its trade network from the East China Sea to the Bay of Bengal. In the following, I explore the contribution of the Dutch East India Company to regional commerce in early modern maritime Asia and to the dynamic economic and cultural interaction that resulted. From the beginning the VOC had chosen western Java as its base in the belief that it could serve as a transit point not only for ships crossing the Indian Ocean to Maluku but also for those heading north to China via the South China Sea. Although the Ming government had imposed rigid restrictions on the entry of foreign merchants into Chinese ports, the Portuguese had settled in Macau with the permission of local authorities beginning in 1557. The Portuguese traders in Macau had amassed huge profits by shipping Chinese silk thread to Japan through the port of Nagasaki and returning with Japanese silver, and the VOC wanted a piece of the action. From its base at Banten, capital of the Banten Sultanate, the Dutch seized Jacatra (present-day Jakarta), a fiefdom of the sultanate, in 1619. Renamed Batavia, it became the VOC’s administrative headquarters in Asia. From here, the VOC continued its campaign to monopolize trade with Maluku while developing trade with China. The Dutch negotiated vigorously with the authorities in Fujian in hopes of establishing their own trading post along the Chinese coast, but the Portuguese succeeded in blocking their ambitions. As a second-best measure, the VOC turned its attention to Japan. From the beginning the Tokugawa shogunate had been eager to forge trade relations with the Dutch in order to counterbalance the influence of the Portuguese, who had a strong foothold at Nagasaki. In 1609, after receiving a personal invitation from Tokugawa Ieyasu delivered by the lord of the Hirado domain (Matsuura Shigenobu), the VOC opened a factory at Hirado, about 80 kilometers north of Nagasaki. Hirado was already an important hub for trade with southern coastal China, and the Dutch saw the trading post as a means of breaking into that lucrative trade while keeping a safe distance from the Portuguese at Nagasaki. As the foregoing suggests, China was at the economic heart of Asia’s maritime trade networks. For this reason, political and economic changes in China drove the development of that trade during the seventeenth century. To trace this process, we must go back to the sixteenth century, when the Ming government, which had formerly monopolized foreign commerce through the imperial tributary system, lost control over trade in the East China and South China seas. In response to repeated raids by the Mongol leader Altan Khan (1507–82), the Ming government had spent huge sums provisioning troops to defend the northern border. This, together with an accelerating shift to silver as the standard medium of exchange, created a huge increase in the demand for silver, which the Chinese obtained through two major routes. China’s first source of silver was the Spanish-controlled mines of the Americas. Soon after the Spanish galleon trade began to ship silver from Acapulco in present-day Mexico to Manila in the 1580s, traders from Fujian and Guangdong provinces began making yearly voyages to Manila and returning with large quantities of silver. The second source was Japan, but since the Ming had outlawed trade with Japan, Japanese silver could only reach China through the extralegal activities of the so-called Wokou pirates. As explained by Murai Shōsuke in the first article in this series, the Wokou of the late Ming were predominantly Chinese bands of traders who smuggled contraband Japanese silver into the southeastern provinces of Zhejiang, Fujian, and Guangdong. Thanks to this lucrative trade, some of the Wokou bands grew into powerful armed commercial organizations with tremendous clout along the southern seaboard. Meanwhile, the flow of arms and provisions to the northern frontier fueled the rise of largely autonomous armed powers in the north. By the end of the sixteenth century, while the Ming struggled to defend itself from external threats, armed commercial interests in both regions were conducting a lively illicit trade, centered on imports of Japanese silver, across China’s northern and southeastern frontiers. Among the armed trade organizations participating in this essentially piratical trade was the VOC, which used Hirado as a major base for that purpose. In the first few years after its establishment, the Hirado factory focused its efforts on importing silk thread and textiles to Japan from China via the Patani factory on the Malay Peninsula, as well as sapanwood for red dye and deerskins from the Siamese kingdom of Ayutthaya, both in exchange for Japanese silver. Soon, however, Hirado took on a more strategic role. In 1613 the VOC began to send provisions, arms, and even Japanese warriors to Maluku to help the Dutch forces there battle the English and Spanish. The VOC also sent ships to attack Spanish and Portuguese ships off the coast of Manila and Macau and capture Chinese junks. Between 1616 and 1621 armed Dutch vessels routinely called at Hirado to stock up on munitions and unload their booty. The VOC continued this piracy until 1621, when the shogunate ordered it to stop in response to protests from Spain and Portugal. From the standpoint of pursuing trade with China, Hirado was scarcely the ideal outpost, not only because of its distance from the Chinese coast but also because of the Ming ban on trade with Japan. Between 1622 and 1624 the VOC made several assaults on Macau and the Penghu Islands (Pescadores) west of Taiwan in an attempt to establish a base near the southern coast of China, but it was driven off by Portuguese and Chinese forces. Then in 1624 it secured permission from the Fujian authorities to build a fortress—Fort Zeelandia—at Taiowan (present-day Tainan) in southwest Taiwan. It then declared a Dutch trading monopoly over the entire island. In addition, the VOC went so far as to induce the Chinese traders it had driven out of business to organize into bands of pirates for the purpose of attacking and plundering vessels plying the trade route between Fujian and Manila. Among those involved in VOC-supported piracy along the coast of Fujian was Zheng Zhilong (1604–61), who had built a great fleet and amassed vast wealth and power through illicit trading operations. Provincial authorities in Fujian, at a loss to control piracy off their coast, eventually turned to Zheng himself to police the waters. In 1628 Zheng was appointed admiral of a fleet based in the port city of Amoy, a position he used to establish a trading monopoly in Fujian Province. Until the mid-seventeenth century, Zheng and the VOC both profited greatly from the illicit trade network that brought Japanese silver to China in exchange for silk thread—Zheng from his bases in Amoy and other Fujian ports, and the VOC from Fort Zeelandia in Taiwan. (Chinese traders also enabled the export of Japanese swords, armor, and other weaponry to Southeast Asia.) Then political upheaval in China again changed the face of regional trade. In 1644 the Ming fell. The Manchus, a northeastern Asian people who had been gaining in strength since the late sixteenth century, crossed the Shanhaiguan (Shanhai pass), seized control of Beijing, and established the Qing dynasty. The Qing quickly pacified most of the country, but one remaining Ming loyalist force continued its resistance from its stronghold in southeastern China. Its leader was Zheng Chenggong, known in the West as Koxinga (1624–62), the Hirado-born son of Zheng Zhilong and a Japanese woman. The Qing government’s biggest fear was that Koxinga would leverage the influence of the Zheng trading empire to forge alliances with Japan and other countries. To prevent such a development, it took drastic steps to restrict maritime commerce with the outside world. In 1661 it ordered everyone living near the coast in Fujian and Guangdong to evacuate to a location 18–30 kilometers inland, thereby turning the coastal region into a no-man’s-land and isolating the loyalist forces under Koxinga. Obliged to establish a new base of operations, Koxinga invaded Taiwan in 1661. In 1662 he forced the VOC to surrender Fort Zeelandia, ending Dutch rule of Taiwan and with it the VOC’s participation in the China trade. Since military pressure had already forced the Portuguese to scale back their activities considerably, China’s international trade temporarily plummeted. The Zheng regime on Taiwan continued to send junks to conduct trade between Nagasaki and Southeast Asia during this time, but China found itself in an economic crunch as it lost access to vital sources of silver. The decline of the China trade in the seventeenth century triggered changes in other countries’ production and trade activity. To substitute for Chinese silk, for which there was high demand in Japan, both the VOC and the Chinese traders under control of the Zheng family brought silk from Tonkin (northern Vietnam) and Bengal to sell in the port of Nagasaki (where the Dutch, at the shogunate’s orders, had moved from Hirado in 1641). The VOC’s trade in Tonkinese silk took off in the 1640s but tapered off in the 1650s, after which Chinese junks handled the bulk of this trade. The VOC’s trade in Bengali silk peaked around 1680 but declined after the shogunate established import quotas and purchase prices to encourage domestic silk production. The VOC abandoned this trade entirely around the middle of the eighteenth century. Chinese and Dutch traders also found substitutes for the porcelain that the Chinese had formerly exported in large quantities. From the second half of the seventeenth century to the early years of the eighteenth century, both the VOC and Chinese traders shipped wares from central and southern Vietnam on the one hand and from Arita in northern Kyūshū on the other to various ports in Southeast Asia. The porcelain from Arita­—named Imari ware after the port from which it was initially shipped—met the demand for goods at the high end of the market, while the former answered the need for low-cost wares. Batavia played a pivotal role in regional trade during this period. Having abandoned its dreams for direct commerce with China, the VOC decided to turn its base in western Java into a hub for indirect trade. After seizing control of the port in 1619, the Dutch had driven out the hostile native population and actively welcomed settlement by immigrants. Chinese immigrants were particularly valued, first as construction workers to aid in building the city and later as merchants and farm laborers. Over time, the Chinese community in Batavia was given a certain degree of autonomy. It was responsible for receiving the Chinese junks and their merchants, who brought porcelain and raw silk from the southern coast of China, and operating the market where they sold their cargo. In this way the VOC essentially outsourced the China trade to Chinese merchants and linked its own trading network to theirs. Although China absorbed the bulk of Japan’s silver exports, Japanese silver found its way all over maritime Asia. The VOC began exporting it to Tonkin and Ayutthaya early in the seventeenth century. At Ayutthaya, the Dutch merchants would trade the silver for deerskins bound for the Chinese and Japanese markets. By the second half of the seventeenth century, however, most of the VOC’s shipments of Japanese silver ended up in Bengal, the Coromandel region, and other Indian centers of textile production. The most desirable of the Indian textiles from the VOC’s perspective was Coromandel chintz, a soft, lightweight, printed cotton fabric. 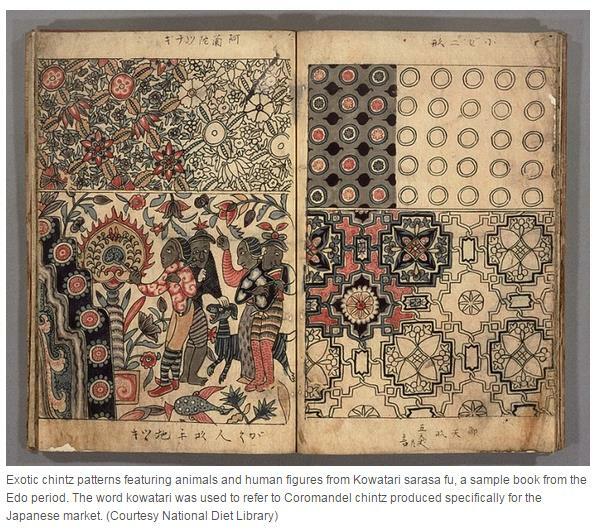 The world had long prized these textiles for their bright, colorfast hues, printed in elaborate patterns using a dyeing technology that no one else had been able to imitate. The VOC concluded exclusive purchasing agreements with local rulers and dyeing guilds to buy the chintz, primarily in exchange for Japanese silver. In 1668 the shogunate—alarmed at Japan’s dwindling reserves—banned the export of silver, and the VOC began using Japanese gold, and eventually copper, in its trade between Japan and the rest of the region. The VOC’s exports of Japanese copper, primarily to Southeast and South Asia, grew more or less steadily through the second half of the seventeenth century. 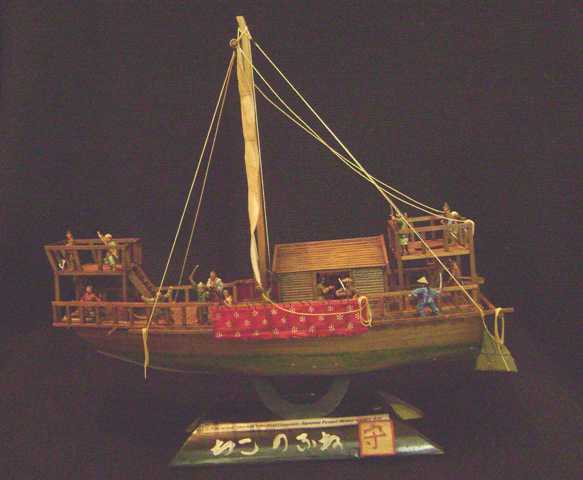 The Chinese junk trade in Japanese copper grew more dramatically, with the bulk going to China to make the copper coins used for small transactions. In 1684, following the fall of the Zheng regime in Taiwan, the Qing government lifted its coastal evacuation order and its ban on foreign trade. The number of Chinese junks entering Nagasaki harbor spiked, but society along the southern coast of China had already adjusted to life under the evacuation order, and the trade patterns of the seventeenth century were never reestablished. During the eighteenth century, China’s population grew rapidly and began to concentrate heavily around Beijing and the urban centers along the lower Yangtze River. This led to burgeoning consumption and a change in consumption patterns, including a growing taste for delicacies previously limited to the court. As a result of these trends, China began importing foods and other consumer goods in large quantities from Indonesia, the Philippines, and other countries bordering the South China Sea beginning around the middle of the eighteenth century. These imports included not only rice but also such delicacies as pepper, edible bird’s nest, shark’s fin, and sea cucumber. China also relied on trade with its neighbors to the southeast for rattan and tin. The former was widely used for furniture among the common classes, the latter for tea containers and joss paper (also known as ghost money), which the Chinese burned on ceremonial occasions. Continental and maritime Southeast Asia responded quickly to these changes in the Chinese market, and Qing policies stimulated trade further. The government had already lifted tariffs on rice imports from Southeast Asia in 1722. In 1747 it gave Chinese shipbuilders permission to move their operations overseas. This opened the door to a boom in shipbuilding activity in the Gulf of Siam and the Mekong River delta, where building costs were lower, and fueled further growth in trade. Toward the end of the eighteenth century, China was importing rice from the Siamese kingdom of Rattanakosin (established in 1782, in the wake of Ayutthaya’s destruction in 1767) and the southern Vietnamese regime of Nguyen Anh (who seized Saigon in 1788). Soon Chinese merchants had settled heavily along the Chao Praya and Mekong rivers and built businesses around the collection and shipping of rice in these areas. In Brunei, Terengganu (Malaysia), and Riau (Indonesia), Chinese settlers established large pepper plantations, while Chinese merchants shipped their harvest to China. In such tin-producing areas as Phuket (off the southwest coast of Thailand), the west coast of the Malay Peninsula, and Bangka Island (east of Sumatra), Chinese settlers played a key role in mine development with the approval of the local rulers, excavating tin ore with the help of Chinese laborers sent from Fujian and Guangdong. Ports sprang up in Riau and Sulu (southern Philippines) for the purpose of shipping the marine and forest products harvested by natives in various parts of continental and maritime Southeast Asia. In this way, the region restructured its foreign trade in response to the changing Chinese market. In the mid-seventeenth century, when the Qing cut off trade, Japan stepped up domestic production of silk thread to make up for the loss of Chinese silk imports. As Japanese producers learned to make the kind of high-quality silk the domestic textile industry required, Japanese demand for Chinese silk dwindled. At the same time, demand for sugar was growing as a result of economic development and the growth of urban consumer markets. 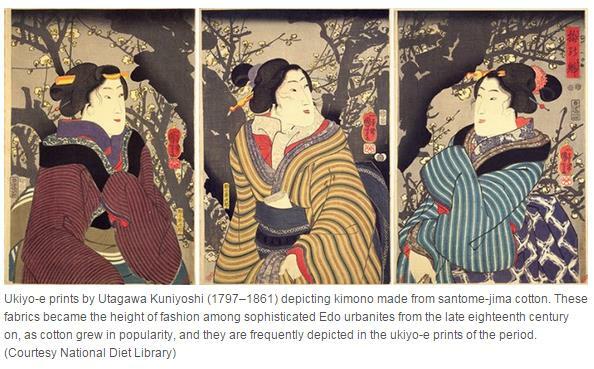 In the eighteenth century sugar replaced silk as Japan’s major Chinese import. The Dutch had introduced sugar as a key crop in the area around Batavia, and during the eighteenth century the VOC shipped a good portion of this sugar to Japan as well. Although sugar remained a luxury item in Japan throughout the eighteenth century, such imports made it accessible enough to enable the development and spread of Japanese confectionery. Rising demand for sweets, in turn, led to the birth of a domestic sugar industry. In the early part of eighteenth century, the shogunate instituted a new set of trade regulations out of concern that the nation’s wealth was draining away. In 1715 it imposed a quota on Dutch and Chinese ships calling at Nagasaki, and in 1730 it began restricting exports of copper. As a result, the number of merchant vessels entering and leaving Nagasaki dwindled, and foreign trade through that port began to decline. At the same time, however, a new trading network targeting China’s growing consumer economy was taking shape in maritime Asia. China’s booming population and the development of its consumer markets fueled growth in exports of Japanese marine food products as well. These commodities, including dried kelp and dried abalone, were known as tawara-mono because they were shipped bundled in straw. Many of them originated in northern Japan, including largely uncharted Ezo (Hokkaidō), a circumstance made possible by the development of domestic navigational routes and the increase in trade to and from Ezo. Japanese copper, which had a high degree of purity, remained in high demand in China for coins and decorative objects, and the VOC left no stone unturned in its efforts to continue securing and exporting it. The VOC also managed to sustain its inter-Asian trade in Coromandel chintz through most of the eighteenth century, but not without some difficulty. Beginning around the end of the seventeenth century, the supply chain the Dutch had secured was disrupted by civil disturbances in the Coromandel region. During that time, dyers in Sumatra, Java, and Sulawesi learned to produce acceptable substitutes, reducing demand for the fabric the VOC was still able to obtain from India. Later the VOC’s cotton business faced further challenges when merchants from Aceh (Sumatra) and Coromandel began their own trading operations, allowing them to offer Indian textiles more cheaply by exporting them directly to Indonesia. That said, much of the world continued to rely on the VOC for high-quality Coromandel chintz. Cotton textiles from Coromandel and other areas were popular in Japan as well. These included a woven striped fabric known as santome-jima (named after the Indian port of San Thomé, or Santhome) or tōzan. Imitated by various domestic makers (under such names as Kawagoe tōzan and Tateyama tōzan), it was particularly popular in Edo. Indian chintz, meanwhile, was prized for its fine quality and exotic patterns, and various sample books were produced to allow merchants to stay abreast of trendy colors and patterns. In some areas, Japanese dyers tried producing their own version of Indian chintz (sarasa in Japanese), such as Nabeshima sarasa, named after the ruling clan of Saga domain. The Japanese used their own dyes and dyeing techniques, and the resulting effect was quite different, but there is no doubt that they took Coromandel chintz as their model. In the end, the failure of the VOC to meet the challenges of China’s developing markets played a major role in its downfall. The VOC had been buying pepper and tin from various Southeast Asian countries since the seventeenth century, and by the eighteenth century it was exporting most of that to China. From the 1720s, the VOC began sending ships to Guangzhou (Canton), the only port open to Western ships, to keep up with the soaring demand for Chinese tea in Holland and England. But by the middle of the eighteenth century, the VOC was having trouble procuring a sufficient supply of goods tailored to the Chinese market. The VOC had attempted to secure a monopoly over the pepper and tin trades through exclusive purchasing agreements with rulers of the pepper-producing centers on the east coast of Sumatra (Jambi, Palembang) and South Kalimantan (Banten, Banjarmasin) and tin-production centers on the west coast of the Malay Peninsula (Perak) and Bangka Island. But attempts to tighten control over production and prices tended to backfire. Chinese and English merchants would circumvent the VOC’s exclusive contracts by visiting production sites on the sly and offering higher prices. As for marine and forestry products, the VOC had no interest in this area of trade. The less the Dutch had to offer for the Chinese market, the less frequently Chinese merchants called at Batavia. Instead they would call at Riau and other ports to purchase the forest and marine products brought there by the Bugis (a maritime people of southern Sulawesi) and other Southeast Asian traders, as well as tin and pepper brought there in defiance of the Dutch. Privately owned English ships bearing guns and gunpowder along with textiles and opium from India frequently visited Riau to purchase goods for the Chinese market. By supplying the Chinese with various goods from Southeast Asia, together with Indian cotton and opium, the English secured a decisive advantage in the Guangzhou trade. The VOC’s position was further weakened by the loss of ships in the Fourth Anglo-Dutch War (1780–84). The erosion of the VOC’s intra-Asian trade, together with internal problems and the birth of a new government in the Netherlands, eventually led to the company’s dissolution in 1799. Previous Post Goto Matabei’s Armour.